The New York Real Estate Commission administers their own examinations for both a salesperson and a broker. The exam is comprised of both national questions and New York state specific questions. The New York Real Estate Broker Exam is 2.5 hours long and the New York Salesperson exam is 1.5 hours long. You must receive a score of 70% or better on either exam to pass. 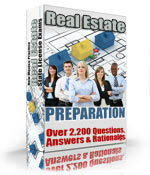 The exam is in multiple choice format and covers any subjects related to New York real estate. Before being eligible for an exam, you must follow the guidelines from the New York Real Estate Commission. You may have to complete certain requirements before being eligible for the exam. If you pass the New York Broker or Salesperson Real Estate exam the results are valid for two years. Remember to bring a current government issued ID to the exam site. The exam is closed book. You are permitted to bring a simple functioning calculator.